Here’s how you can translate the theme so your web viewer can also enjoy your site in their native language. we’re going to modify “Search Results for :” and “Sorry, but nothing matched your search terms. 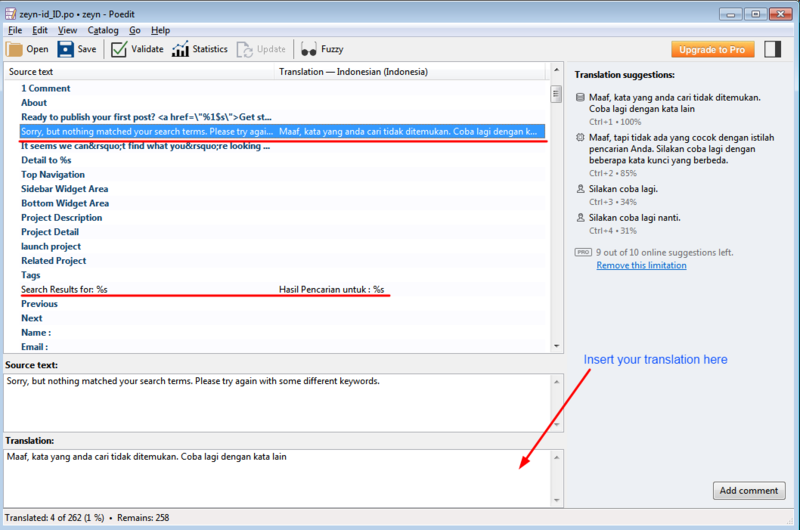 Please try again with some different keywords.” into Indonesian on the search page for an example. Copy wp-content/themes/zeyn/languages/en_us.po into wp-content/languages/themes (if the folder doesn’t exist, please create it first). Rename en_us.po to your language code, with a prefix omnipress-(ex: detheme-id_ID.po for Indonesian Language). Save the PO file. Poeditor will generate detheme-id_ID.mo make sure this .mo file exists in the same folder as the .po. WordPress will use .mo to translate the site. Rename /zeyn/languages directory into something else, for example lang, in order to disable this folder from wordpress language indexing. Once you’ve done with steps above, navigate to Settings > General > Site Language. Select your language from select option.